I'm going to come right out and say I don't LOVE the holidays. It's fun to give and receive gifts and I like to look at the Christmas lights and festivities around town, but I don't really decorate my home. I was raised Catholic, but I don't practice religion now, but even so, it seems a bit crazy to me the way shopping and consumerism gets way out of control at the holidays to the point where people are running each other over with shopping carts and so forth. It's depressing! All of this is just to say that I don't typically go out of my way to buy a bunch of Christmas- or holiday- themed stuff because I usually get sick of it by the time Christmas rolls around. So when I had a chance to try the Caldrea holiday line of products, I wasn't sure what to expect. The good news is they sent me some really classy-looking stuff that would definitely go with any Christmas decor, but isn't too themed out. 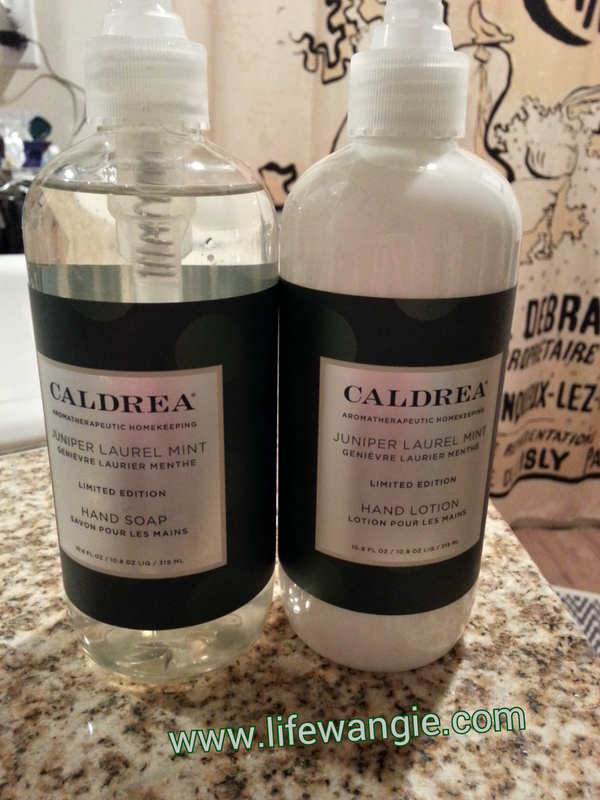 I've tried little samples of Caldrea stuff before, but I don't think I have ever had a full-sized one. The prices always seemed a bit steep to me. An 8 oz. bottle of hand soap retails for $10.50 on their website, and a 16 oz. bottle sells for $12.50. There's a larger refill available too. I can get a generic brand for like $2 at the grocery store. But I am always tempted to buy nicer hand soaps, especially ones that have a nice fragrance or package design. And sometimes I do like to have little luxuries like this in our home to make things feel nicer. I received an 8 oz. hand soap as well as an 8 oz. lotion to review from Caldrea. Caldrea's tag line is "Aromatherapeutic Living," and they really promote their scents on their website. The scent in these two products is quite strong. I like the fragrance; it's sophisticated and somewhat masculine in a cool way. It does say "Holiday" because of the woodsy element of it, but it's not cheesy holiday, like all pumpkin spice and peppermint. If fragrances bother you, you would want to avoid this product. The hand lotion is especially strong, maybe because you don't rinse it off like you do the soap. I don't think I personally will use the hand lotion, but my husband likes it. I will definitely use up the hand soap, though, and after it's gone I will probably finally spring for a full-size of another fragrance I have tried in the past, the Sea Salt Neroli.